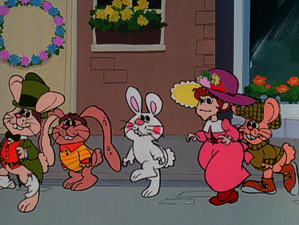 The origins of the Easter Bunny are explored in another of Rankin/Bass’ holiday specials. 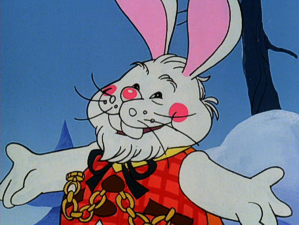 The wonderfully warm and magic tones of Burl Ives’ narrator and some typically professional, if slightly lacklustre, vocal performances are just about the only major recommendation of note for The First Easter Rabbit, the Arthur Rankin and Jules Bass contribution to the Easter Bunny legend. Rankin and Bass had, of course, became known for their sometimes quite brilliant and often very charming stop-motion films, from theatrical outings such as the underrated and all-too forgotten Mad Monster Party, to a hugely successful series of television perennials including Santa Clause Is Comin’ To Town, Rudolph The Red Nosed Reindeer and Jack Frost among many others. As those kinds of productions became less viable, and the cost of overseas cel animation became more attractive to Saturday morning television programmers, Rankin/Bass returned to the hand-drawn medium for their later shows, where they would later find popular success with the feature film The Last Unicorn and the franchise series ThunderCats. However, after churning out the holiday specials year on year for well over a decade, the switch in technique for this particular title might have been an aim at injecting a fresh angle, but unfortunately the plotting, a slightly confused tale (with a touch of The Velveteen Rabbit) in which Santa Clause brings cuddly toy rabbit Stuffy to life so that he can deliver the baskets of Easter goodies to the world’s children, doesn’t really do that much with its opportunity. However, there is something to be said about those largely enjoyable vocals, with Ives’ folksy charm up front as our storyteller – a role he well fashioned for himself during a long career as an actor (including Disney’s Summer Magic) and children’s recording artist – and a line up of familiar animation names. 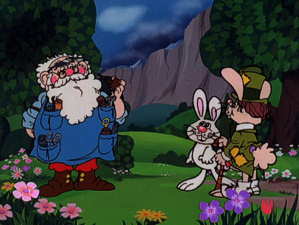 Before voicing Rankin/Bass’ Jack Frost for their 1979 special, Robert Morse joins the Rankin/Bass team as Stuffy, the Easter Rabbit himself, and provides the same kind of friendly appeal, while none other than cartoon veterans Stan Freberg, Paul Frees and Don Messick are also in the line-up, lifting the interest for older viewers who might have fun guessing who is providing which voices and find some unintentional humor in little girl Glinda, who sounds as if she’s completely spaced out. 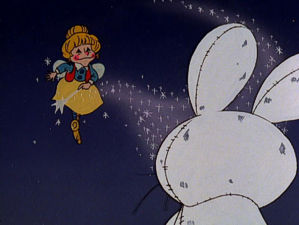 Arthur Rankin and Jules Bass’ stop-motion television specials had a magic charm of their own that deservedly see them brought back each year for annual showings. Warners’ Deluxe Editions over the past two or so years have managed to make those shows (and those from other stables, as Chuck Jones’ original Grinch and Horton outings) nostalgic treats again, but sadly The First Easter Rabbit doesn’t slip into the same league as even Rankin/Bass’ own The Easter Bunny Is Comin’ To Town or Jack Frost, both released in 2008. However, with the package labelled as being part of The Rankin/Bass Collection, it may entice fans of the producers’ work to be curious, and hopefully some more of their more celebrated specials may find their way to Warners’ disc treatments soon. 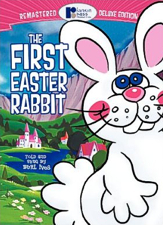 One of the things not particularly encouraging a big, whole-hearted recommendation for Warners’ The First Easter Rabbit disc is a distinct lack of “deluxe” in this “deluxe remastered edition”. 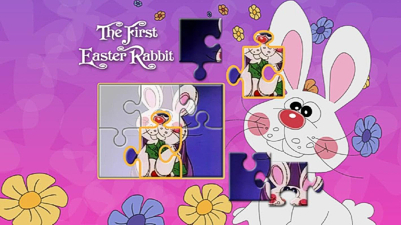 Apart from the new transfer of the main program – itself only 25 minutes of content – all we are given as added Easter goodies is a meagre basket of Six Menu-Based Puzzles For Kids, none of which are particularly exciting (even for kids) or come with any kind of gameplay explanations, and only replay scenes from the special when completed. If Warner Home Video wants to make something of their Rankin/Bass library, they really need to take stock of the titles they have and look to arrange them by theme to include three or four specials a disc, or dust off some decent added value content. What a joyous surprise their Chuck Jones’ Horton Hears A Who! disc was, not only packed with other specials but a full 90-minute retrospective special on author Dr Seuss. There’s nothing like that here, even though Rankin/Bass’ work and career are surely worthy of some retrospective? If ever there was a title that needed a couple of bonus Easter Eggs, this would be it but, for the record, the disc does contain previews for Scooby-Doo: Abracadabra-Doo and the Peanuts Valentines/Easter specials, though not even anything generic to advertise other Rankin/Bass titles on DVD. Perhaps attempting to suggest the “deluxe” aspect in the packaging, the case comes housed in an embossed slipcover as glossy and shiny as any Easter treat. 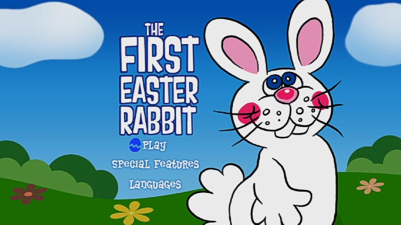 However, the flat animated characters don’t give the designers much to go on in terms of creating cover art, and the back image of one of the bunnies (not wishing to spoil the special’s final few seconds “twist”) looks pretty low-grade. The same artwork – which continues the Rankin/Bass Collection branding – is repeated on the sleeve in a standard keepcase and on the disc art. For such a colorfully drawn animated piece, there might be some apprehension that colors might easily bleed, but Warners’ transfer, from the original film element, keeps everything in check and looks just right, for what it is, in its original television aspect ratio of 1.33:1. Likely coming from a 16mm source, it appears crisp and clearer than one would expect for its age, with a little light grain not as noticeable as what looks to be a print mark running about a quarter into the image from the left, though this has been patched up and rendered next to invisible by the digital cleanup, and it’s overall a nice transfer that probably looks better than it did when it played on television way back when. The basic mono mix’s great strengths are the vocal recordings, which are very clean, and a distinct lack of any background noise (which may or may not be down to a certain “Don Hahn” listed in the end credits). Tinny television speakers of the time mean it wasn’t ever intentioned as a track with a lot of dynamic range, but it’s been reproduced here with clarity and zero distortion, and the music sounds as warm and rounded as it can. English and French subtitles are included. $15 for just a below average 25 minutes of television is just simply not that much of a great deal considering other product arriving in the marketplace at the same time, WB’s own Bugs Bunny’s Easter Funnies to start with. The previously released Jack Frost disc suffered from the same lack of bonuses, but at least that program had length at double the run time. It does remain very nice to see Rankin/Bass’ specials getting decent recognition, but the way forward here has to be groupings of content to provide Warners with good sales, and audiences with value for money. 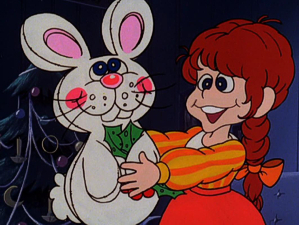 With a total lack of solid extras, The First Easter Rabbit can only honestly be said to be fluffy fun for those fans who collect each and every Rankin/Bass special.